The true quality of Temple Beth Sholom is measured in the congregants who choose to be a part of our community. Our congregation was born in 1942 during the height of World War II. Our Temple grew as GIs returned from war and settled in Miami Beach with their families. 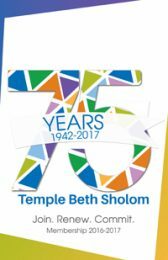 Hundreds came to us and our programs in Jewish education, culture, ritual, prayer, and Israel grew and flourished.This year Temple Beth Sholom celebrates 75 years of growth. We have a history of families who consistently renew with our congregation spanning 5 generations. Lasting memories of their Brit Milahs, Bar/Bat Mitzvahs, confirmations, weddings and more have kept us connected. I welcome and encourage you to continue to grow with us and strengthen us by your involvement. May we grow together from strength to strength. 75 reasons we love tbs . . .
Click to download the following forms. For questions about this form or submission.